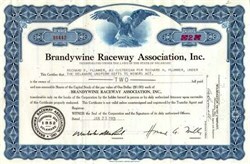 Beautifully engraved certificate from the Brandywine Raceway Association, Inc. issued in 1954-1968. This historic document was printed by the American Banknote Company and has an ornate border around it with a vignette of an eagle perched on a rock with its wings spread out. This item has the printed signatures of the company�s president and secretary and is over 32 years old. John Rollins was for more than half a century was an icon in the state of Delaware. Former lieutenant governor of the State of Delaware, Mr. Rollins was strongly associated with community, philanthropic and national activities. He was known throughout the business world for his major holdings in many noted national and international companies that he founded and owned. Mr. Rollins also played an important role in both of Delaware's major sports--NASCAR and horse racing. Mr. Rollins was a prime mover in bringing world-class motor sports to Delaware. Today, Dover Downs International Speedway brings hundreds of thousands of fans to the state to attend two nationally prominent "MBNA Platinum" weekends of competition in June and September. Mr. Rollins also served as chairman of Dover Downs, which in recent years has grown to become the seventh-leading motor sports venue in the world and among the leading harness tracks in the U.S. In harness racing, Mr. Rollins was a devoted benefactor of Delaware interests for almost 40 years. He subsidized the sport for a number of financially draining years at Brandywine Raceway and Dover Downs. When Brandywine closed, it was Mr. Rollins' efforts that continued harness racing at Dover Downs. Since the rebirth of the racing industry in Delaware, Mr. Rollins personally challenged raceway management to make Dover Downs the finest facility possible for horsemen and fans alike. Dover Downs has risen to become one of the most talked-about facilities in the sport. At one time during the 1970s and 1980s, Mr. Rollins was a substantial shareholder in all three of Delaware's harness tracks--Dover Downs, Harrington and Brandywine. Mr. Rollins was also a prominent horse owner and breeder. He was a member of the Amicable Racing Stable, once owner of legendary pacer and stallion Albatross. Mr. Rollins also owned pacer Jefferic Adios, who set a track record at Dover Downs in the early 1970s. In addition to enjoying NASCAR events with friends and family at Dover Downs, Rollins frequently attended harness racing, often with his wife, Michele, and his younger children.